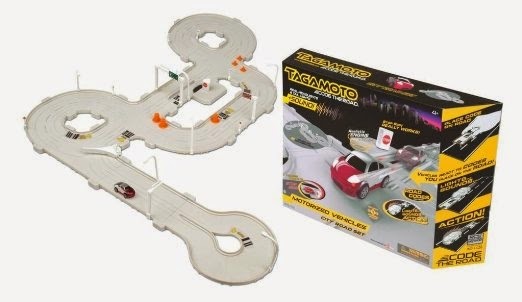 We've long been fans of HEX BUGS and now they're making a super cool race track where kids 4 and up can "code the road". These sweet cars have real headlights and taillights and sound! Powered by the patented HEXBUG Nano motion technology. Get your geek on and teach your girls and boys about STEM early, in a way so fun they won't even realized they're learning. Open nationwide through midnight 12/20. Disclosure: Once again. It's our pleasure to partner up with HEX BUG. Thanks to them for providing us with our giveaway. As always, all opinions are our own. Each driving experience can be different with the Tagamoto™ City Road Set. 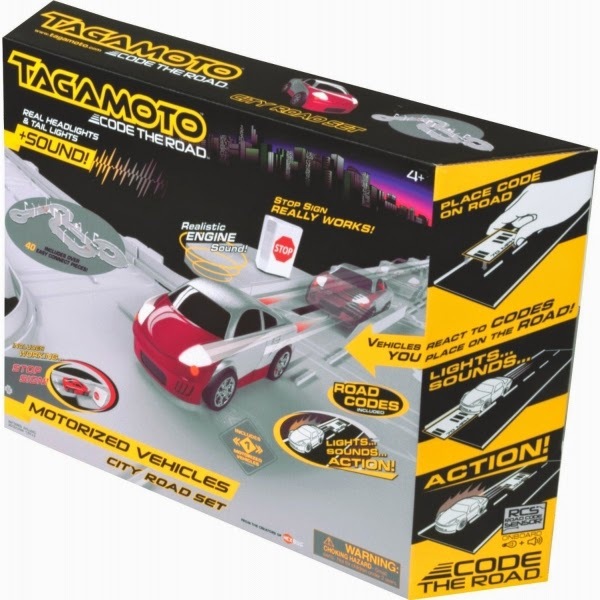 The City Road Set comes with one collectible vehicle with lights & sound that reacts to codes on the road, more than 20 bar-codes, and over 40 easy-to-connect pieces. These high-tech cars have real working headlights and taillights, and more than 15 different sounds including engine revving, car horns and sirens that are activated by codes placed down on the road. Includes 20 bar-codes for customized play, making each driving experience different. 40 easy-to-connect pieces including: straights, four-way intersections, curved pieces, cul-de-sacs, three-way tees, road closed pieces, street lights, double and single overhead road signs, road cones, barrels, street signs, flip down diverter and either 1 stop sign or 1 toll booth accessory. Check back with us and enter like we vote in Chi, IL... early and often. It's rewarding! ChiIL Mama's Holidaze 12 Days of Giveaways is on through December 20th for prizes 7-12, with loads of great daily giveaways, flash giveaways on Facebook/Twitter, gift guide ideas, and holiday happenings in Chi, IL and beyond. All giveaways are open nationwide. Here's the master link where ALL our 12 Days of Giveaways Are Added.